NOTE: Some of these options will be hidden if you're in a consolidated multi-farm, or if your budget is locked. Configure accounts allows you to see all accounts from your Xero chart of accounts, and change its categorisation, payment period, and detail in budget. Along with these options per account, you're able to copy the entire configuration from another farm you have access to, provided the two farms share account codes. For more detailed information about account configuration, check out this article. By default, transactions within a budget season are limited to the season in which they were created. The budget season overflow function allows you to bring across forecasted cash transactions from the prior years accrual budgets / forecasts. Use the dropdown box provided to select whether you wish to overflow from the budget or the forecast, and you can nominate to include production tracker transaction information too. Review the screen above and if you’re happy, just click on the Overflow button to import those transactions into your budget. A good way to start a new budget is by exporting out a copy of last year’s actuals from Figured and then importing this as the basis for your budget this year. Details of on exporting and importing a budget can be read about here. This button allows you to lock off and approve a budget for a budget year. You can go back to the budget view and unlock it at any time. 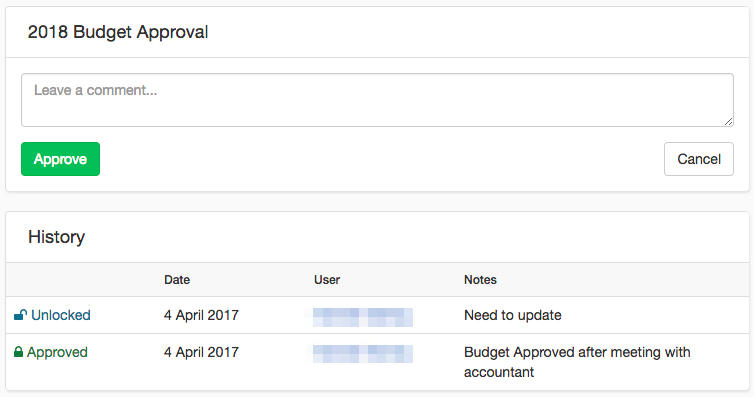 When locking the budget you can add a notes which will get added to the audit log. A history will also show who has locked and unlocked the budget for that year, along with any notes they have made.